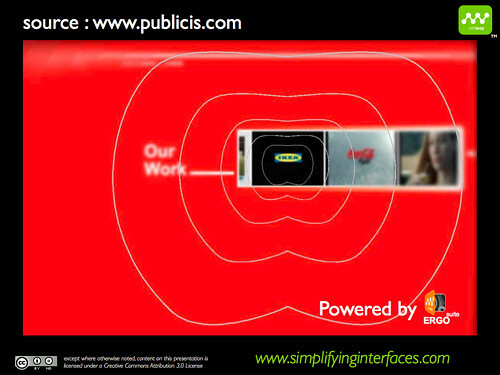 Eyetracking material allows you to see what users have looked at, but not necessarily what they have seen. Yes, you read it correctly. Because it is the brain that guides the eye so it can find the information the brain needs to solve a task. When a user arrives on an interface, he has built what’s called a mental model. This is some kind of map containing the task to be done, the information he has on the subjects, the experiences and interfaces he has already visited and so on. The central administrator, the reflection centre of our brain, is the head of this metal model. In order to find a solution to the task at hand, our brain will have to find information outside the brain. And to do that, it needs the eyes. The brain will guide our eyes to find data on the web interface. The eye consists of cones and sticks. 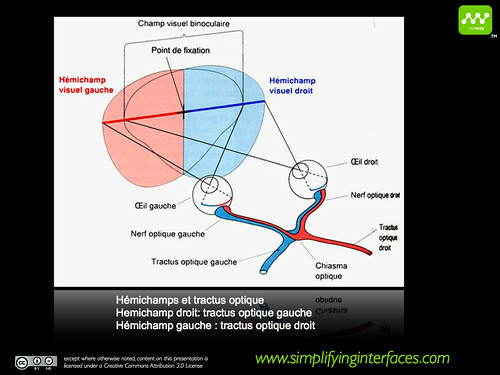 These cones and sticks are placed on the retina. As a result, our eye is capable of gathering information in an angle of 3 degrees. At 50 cm away from the screen, which is the average distance measured in physiological ergonomics, the net zone we can see is a circle of circa 2,5 cm. This net zone is called the foveal vision. The further we go away from this circle, the less sharp our vision will become. This is called the peripheral vision. Furthermore, vision has a particular shape. Our brain doesn’t need to see its environment with a 100 % acuity in order to analyze its components. An example: you are now reading this article. Without taking your eye away from the screen you can easily evaluate the elements in the room you’re working in. They will be blurred but you can name them. What you just used, is your peripheral vision. If you want to get precise details on the object, you will move your eye towards it. And that’s your foveal vision. The same thing happens on an interface. The brain will get a general idea of the graphical elements using the peripheral vision. And as soon as it wants precise information on something, it will direct the eye towards the zone where it can find the info using the foveal vision. The brain wants to perform a task. It has an idea on how to do this, using its mental model. 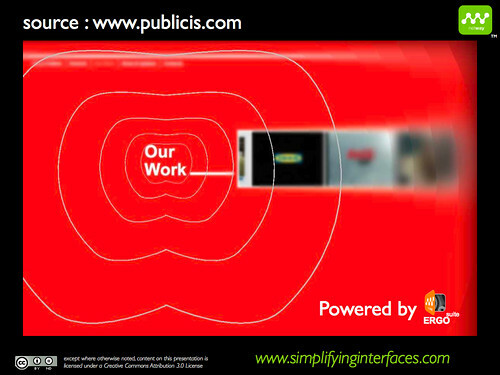 So, when it arrives on an interface, it will guide the eyes to where it thinks it will find the information it needs. The path our eyes will follow consists of a combination of fixations and saccadic movements. It will never cover the entire interface. This means our brain will make certain efforts in order to find the information it needs on the interface. And that’s where problems start. Because, before sending the eye to a certain spot, it will first, non-consciously, try and get as much information as possible using its peripheral vision. But, as the peripheral vision is blurred, the brain will make deductions rather than analyze each different zone of the interface. So, what will happen when you put an element of navigation that looks like an advertising banner? Our brain won’t direct our eyes towards it in order to find more information on the navigation of the interface. So, what will happen when an important element of your interface can’t be seen using peripheral vision? Our brain won’t use the foveal vision to know more. 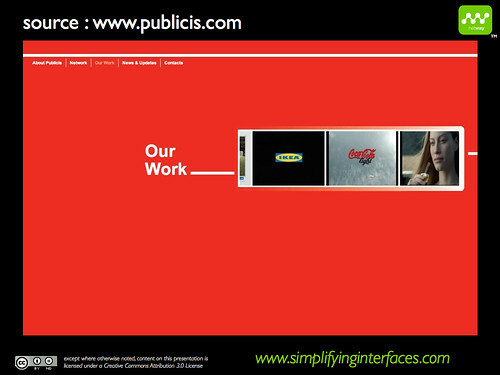 Here’s an example of the Publicis site. Fix your eye (foveal vision) on the letter “O” of the work “Work” at the left side of the interface. 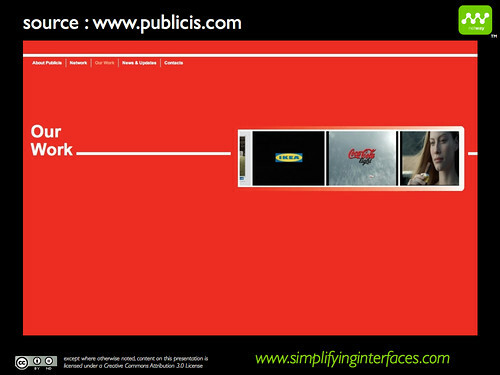 Now, without moving your eyes, try and see whether you recognize the logos at the right side of the interface. Now fix your eye on the IKEA logo at the right side of the interface. Don’t move your eyes and try to read the title at the left side. And here’s what your brain has received by fixing on the logo IKEA. This interface forces users to make long saccadic movements to find information and link it in the brain. By changing the placement of the title, unnecessary eye movements can be avoided. So, here’s what your brain will receive by focusing on the letter “O” of the word “Work”. And here’s what your brain will receive by focusing on the IKEA logo. When an expert builds interfaces, he will take into account these data. 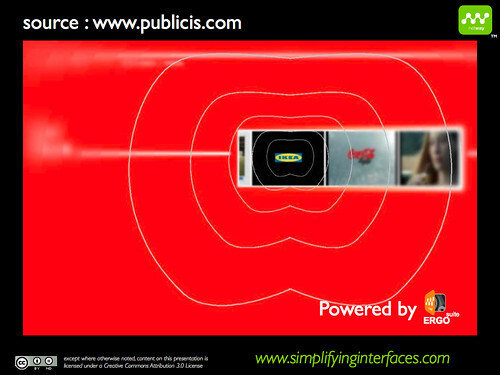 All Netway techniques are aimed at generating types of precise ocular behaviour in order to guarantee an optimal user experience. I propose you try and apply these finding on one of your own screens. Don’t hesitate to share this content with your friends or your colleagues and ask them to check out this blog! Many thanks.